Since my 50/1.2 Nikkor AIs has a CPU (though the miracle surgery performed by Eric Lund aka 'Dr. Lens' or 'The Great Dane'), it fits my Nikon 1 V1 camera through the FT1 adapter to give full exposure metering and a working focus magnifier. Both features, which are crippled without the CPU, are virtually prerequisites in order to have any command over the fast 50 lens on this tiny camera. While one can bracket exposures, so available metering isn't a complete deal-breaker, the poor EVF/LCD panel of the 1 V1 makes critical focusing impossible unless you can activate the magnifying feature. In a week's time I'm off to visit Erik again so we can explore the possibilities of making a "chipping" solution for non-CX lenses on the 1-series Nikons. I found that the necessary parts (mount, contact block, etc.) could be retrieved using components of the inexpensive 10 mm f/2.8 1 Nikkor and have ordered a few complete kits for our experiments. No problem getting these from Nikon Europe through my friendly Nikon repair facility. If I'm lucky they'll arrive before I depart Oslo, if not we'll scavenge an existing 10 mm for the required parts. I plan to make a chipped focusing mount for the 55 mm f/1.2 CRT Nikkor. There will also be chipped mounts for the 50 mm f/0.75 Rodenstock Heligon or Oude Delft Rayxar; but with no focusing as you need to keep as short back focus distance as possible and a focusing mount is not suitable in this setting. We might also whip up a generic "F-mount adapter that will enable metering and focus magnification with any F-mount lens, at the expense of not having a unique identification written into the EXIF. I think most can live with that drawback. Oh well, back to the current Nikkor 50 mm f/1.2. As many are aware of this is a manual-focusing lens still listed in production by Nikon, and despite its venerable age evidently there are no plans of an update of the optics. Image drawing is first rate and its has sufficient 'personality' to endear itself even to a hard-core user like yours truly. I spent yesterday with the 50 on my 1V1 to explore the amazing autumn colours we all of a sudden got here in my neighbourhood. Pretty unusual as most autumns tend to be rather drab, but not this year. 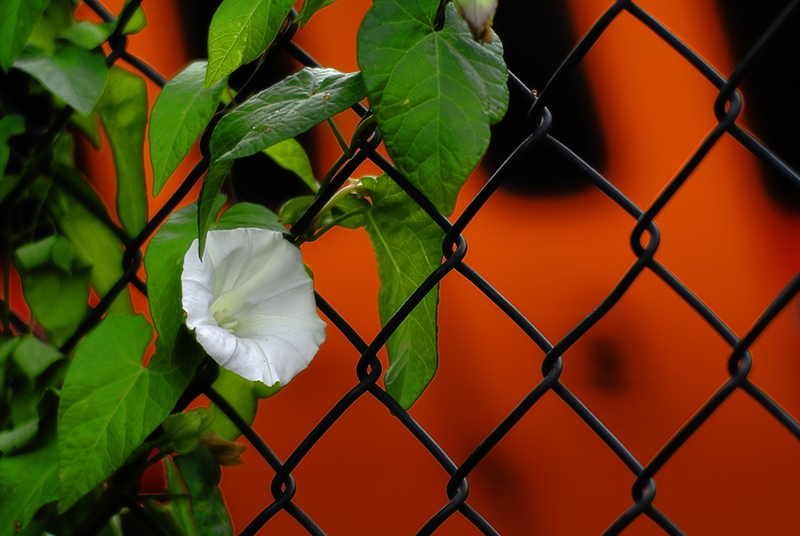 The hedge bindweed (Calystegia sepium) shows off its bright flowers long into the season, and its foliage tends to keep the green colour most of the time. Here I shot it with a passing train as a backdrop. Do note this picture shows the effect of a "rolling shutter" (train moved from left to right). I specifically waited for a red train as red in juxtaposition to green has a special implication over here in Norway and makes for a great colour combination elsewhere. 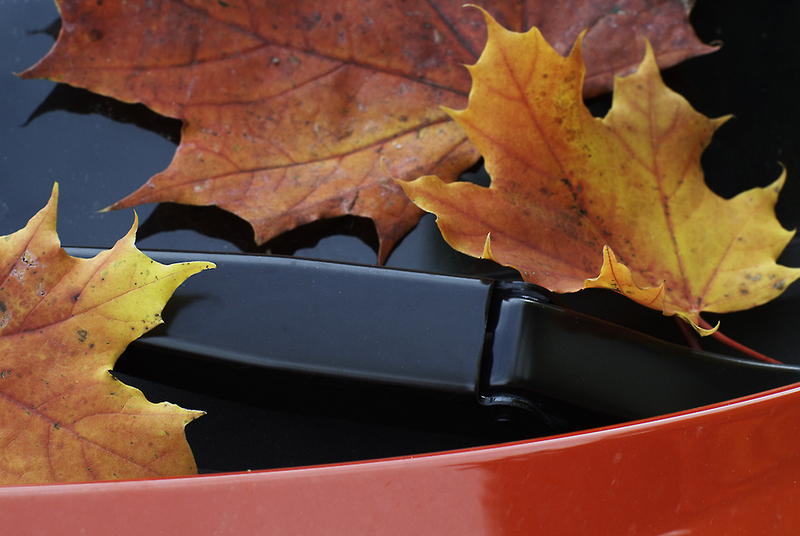 The bonnet of my little red Peugeot is a perfect backdrop for the autumn foliage of the Norway Maple (Acer platanoides), which despite its name is not very common in my country. 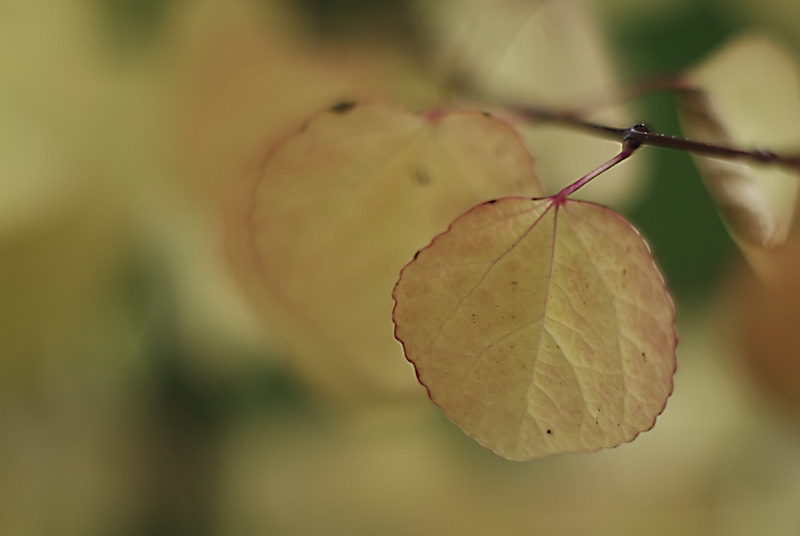 Its autumn gold- and bronze-coloured leaves dropped while I was shooting the Katsura tree (next picture). For using fast or exotic lenses, the Nikon FT1 adapter might be problematic as there is a rectangular cut-out in the front, immediately beneath the bayonet mount. However, this cut-out should not affect on-axis illumination of the frame, but might influence blur circles *if* the angle of coverage is large. On the 1 V1 that implies a very short focal length might give issues. I have not observed any problem with the lenses tested so far on the FT1. For example, the 50 mm f/1.2 would be a problem according to Nikon's warning but in practice none has been observed. Also, blur circles of this or other fast/faster lenses appear normal. The reason why I am enamoured by the combination is there is not anything similar in the 1 Nikkor (CX mount) lens line. True, Nikon provides the 32 mm f/1.2 1 Nikkor, and apparently this is a decent lens. But its tactile feel and handling are miles away from the Nikkor AIS, and due to its shorter focal length, it is less efficient in creating smooth blurs and creamy bokeh. I do have the 32 available for testing and will take it with me on my forthcoming trip to Ireland (mid July this year). I surely wish Nikon USA would sell parts like this; since 2012 they have sold almost nothing except things like grip rubber on some cameras. Unless you're one of the 17 or 18 Nikon authorized servicers in the USA, you have to order parts from sources abroad on eBay. Will be looking forward to the outcome . . . I'm not authorised by Nikon for anything, but my liason with the national Nikon repair facility is excellent. Thus, I'm able to order anything Nikon can deliver. However, be aware that building a camera or other photographic item entirely from spare parts will lead to a price 10-50X that of the original. Spare parts involve human labour and the cost increase is astronomical. I seem to remember a statistic that was published in Britain sometime in the '70s. To buy a Mini off the dealer showroom floor was somewhat less than GBP3,000. To build the same car using just new spare parts was upward of GBP30,000.